THUNDER BAY Brings Homemade Gift Ideas That Charm! Thunder Bay has just won my heart and my urge to constantly be creating bringing several projects that are perfect for the holiday season. By expanding its crochet titles, I want to share with you the new projects and that I have taken on! 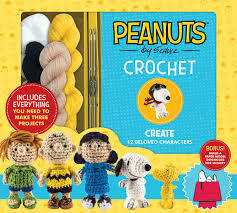 Let’s start with the PEANUTS CROCHET kit that includes five colors of yarn, two mental crochet hooks, stuffing, tapestry needle and embroidery threat. Now what will you be creating with this? Well Charlie Brown of course but you won’t be stopping with this iconic character. There is enough material to also create Snoopy and Woodstock. If you are like me you will be wanting the entire gang including Linus, Franklin, Lucy, Sally, Peppermint Patty, Pigpen, Flying Ace Snoopy, Schroeder, Marcie and even Schroeder’s piano and Linus’ blanket and Snoopy’s doghouse because a full color paperback manual is also included to give you step-by-step instructions to complete the gang! When I began to create Charlie Brown I will admit to being a little bit nervous. The funny thing is I have been crocheting since I was seven years old so nervous never occurred to me. I had no reason to be because once I began slowly to make sure I was doing it right – off I went! It is so fantastic to slowly see Charlie Brown, then Snoopy and finally Woodstock come to life. In case you are wondering, I absolutely intend to create the whole Peanuts gang as I want to give them all to my granddaughter for her room. 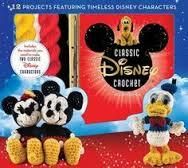 The next crochet kit is the Disney Classic Crochet that brings it together creating Mickey Mouse and Donald Duck. The kit includes the tapestry needle, embroidery thread, three colors of felt, yarn and materials to create these loveable and memorable characters. Once again the kit includes the instruction book so that creating the gang will be simple. Add to the Disney characters are Minnie Mouse, Daisy Duck, Goofy, Pluto, Chip n’ Dale, Dumbo, Bambi, Lady, Pinocchio and Jiminy Cricket (which has been the most fun to see come to life in my needle crafting hands!). These characters will be adorning my grandson’s room! Finally, Thunder Bay brings the Star Wars Crochet kit that includes yarn needle, safety eyes to create my ever favorite Star Wars character Yoda and a Stormtrooper. Yes, once again an instruction booklet is included to create C-3PO, Princess Leia, Wicket the Ewok, Luke Skywalker, the loveable R2-D2, Han Solo, Chewbacca, Boba Fett, Jabba the Hut and finally – Darth Vader. I am so excited that Yoda turned out so amazing that I’m whizzing through the rest of the characters. 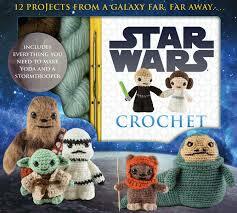 In case you are wondering – the Star Wars crochet characters are staying with me. Oh yes, that’s right I am a Star Wars fan since the first film opened all those years ago. Along with my own Star Wars collection, the best part of it will be that these characters are created by my own hands so they will be living with me! Thunder Bay Press publishes a wide range of formats that include fun interactive activity titles and kits for such things as origami, cooking, crafts, games and art. They also carry books on art, fitness, pets, travel, history, culture, sports and nature. There is something for everyone and you can see for yourself at http://www.thunderbaybooks.com. Working on these projects has been so much fun for me. There is something amazing about creating anything with my own hands but it’s even more meaningful knowing they will someday belong to the people I love. That’s the emotional thing about creating these characters – especially for us Nana’s who want to home make something for our grandchildren. It means so much that one day they will appreciate the time and love that goes into creating each of these memorable characters. I can not wait to try more of the creative things that Thunder Bay has to offer and sharing them with you. So take a moment to consider the PEANUTS, DISNEY and STAR WARS crochet kits for someone you know that has a love of not only these iconic characters but of those who would appreciate such a special gift for the holidays.